How Are Tendonitis and Bursitis Different? Tendinitis and bursitis are two relatively common conditions that involve inflammation of the soft tissue around muscles and bones, most often in the shoulder, elbow, wrist, hip, knee, or ankle. So closely are these conditions related that people will often use the terms interchangeably. That would suggest that something like, say, rotator cuff tendonitis is pretty much as the same thing as shoulder bursitis, but that's clearly not the case. Or is it? Tendinitis refers to inflammation of the tendon, the rope-like, fibrous tissue that connects muscle to bone. When a muscle flexes or relaxes, the tendon acts like a winch and causes the bone to move. Tendons can be small, like those found in the hands and feet, or large, like the Achilles tendon. Bursitis is the inflammation of the fluid-filled sac, called the bursa, which acts as a cushion between bones and the tendons or muscles surrounding the bone. The bursa greatly reduces the friction as these structures regularly rub against each other. The major bursae are located adjacent to the tendons of the large joints, such as those in the shoulders, elbows, hips, and knees. Because tendons and bursa are often closely situated, any inflammation that occurs in one may affect the other. 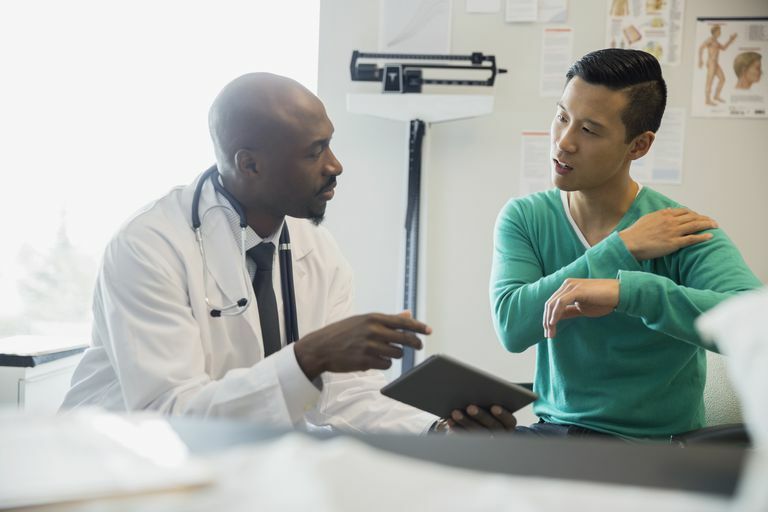 This is why a diagnosis of "rotator cuff tendonitis" and "shoulder bursitis" may sometimes be used to describe that same event. They are independent yet co-existing conditions that are sometimes, but not always, caused by the same thing. By and large, tendinitis is caused by an acute injury or repetitive motion (such as hammering a nail, running, or playing tennis). Bursitis, meanwhile, can be caused by the same things but may also be the result of an infection or conditions like gout or rheumatoid arthritis. While bursae are vital to helping tendons glide over bones, not all tendons have a bursa. Bursa only forms where there are bony prominences, such as in the shoulder, the outside of the hip, or the kneecap. Resting the affected area is the first step to healing. It involves avoiding aggravating movement and may require a splint or support to ensure the area is fully immobilized. Pain is the first sign that you’re not giving the injured area enough chance to rest. Applying an ice pack helps control the inflammation and decrease swelling. By minimizing both of these things, the tendons and bursa can return to their normal state. Nonsteroidal anti-inflammatory drugs further help alleviate inflammation and pain. Advil (ibuprofen), Aleve (naproxen), and aspirin are popular choices. The analgesic Tylenol (acetaminophen) provides pain relief but doesn’t reduce inflammation. Cortisone injections may be used if the symptoms are persistent. Cortisone is a powerful anti-inflammatory drug that provides short-term pain relief but tends to be less effective as a long-term therapy. Physical therapy can strengthen the surrounding muscles, alleviate stress on the affected area, and prevent recurrence. In cases where bursitis is caused by infection, antibiotics may be prescribed. Treatment of bursitis may also be focused on treating any underlying condition such as arthritis. National Institute of Arthritis and Musculoskeletal and Skin Diseases: National Institutes of Health. "What Are Bursitis and Tendinitis?" Bethesda, Maryland; updated November 14, 2014.